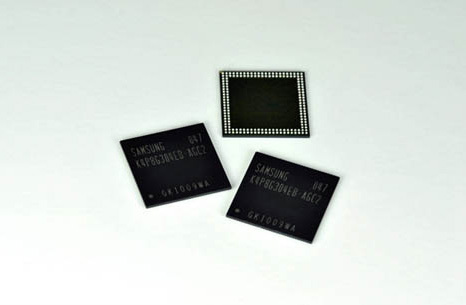 Samsung Electronics announced today that it has developed a new 4GB low power double-data-rate 2 (LPDDR2) DRAM chips, especially for smartphones and tablet PCs. The new monolithic four gigabit chips are made using 30 nanometer (nm) class process technology and Samsung says that it can transfer up to 1,066 megabits per second, which is more than double the performance of the industry’s previous mobile DRAM — MDDR, which operates between 333Mbps and 400Mbps. Samsung also prepares new 8Gb DRAM which packs two 4GB chips and offers a 20 percent package height reduction (0.8mm vs. 1.0mm) and will consumes 25% less power than previous 8Gb package that used four 2Gb chips. This will allows longer battery life, as well thinner and lighter mobile devices. The 4Gb LPDDR2 is already sampling and the 8Gb chips are expected to be available later this month.